Avnish Sharma popularly known as Desperado Avii has launched his first single O Meri Jaan – A Story Unheard. 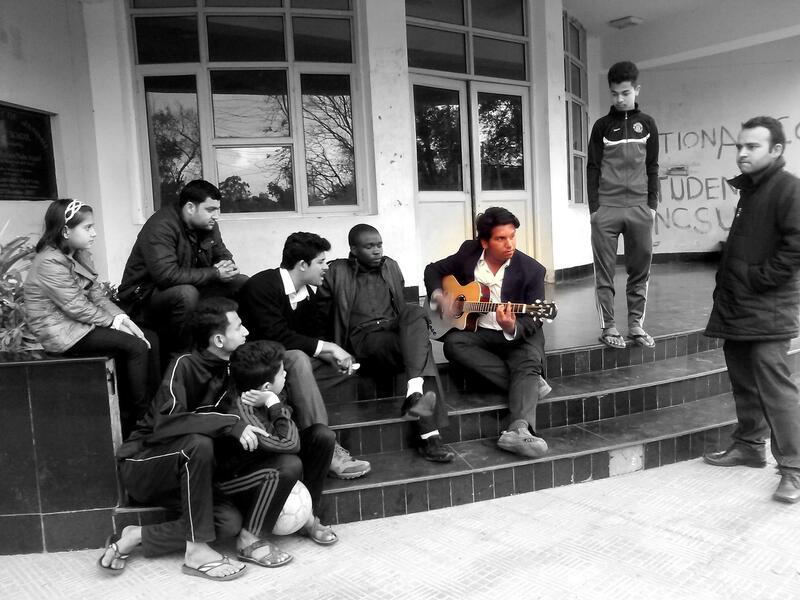 Avnish is a 5th year student from The Law School, University of Jammu. This mega debut was launched at City Square Mall, Jammu City where more than 1000 people witnessed this mighty extravaganza. The moment the voice of this star came out, the crowd went mad with cheers and whistles. This is the first song online by Desperado Avii. On the very first day ReverbNation Pop charts for Jammu, IN took him to No. 3 position. This song is available for free download on Reverbnation and Youtube. With countless downloads, countless shares, this songs has become the heartbeat of people all over India. We had the privilege to take his first exclusive interview after the launch of O Meri Jaan. (Laughs) Well, I don’t know how to answer this but I’ll say that Im an enthusiastic guitarist, a devoted singer and yes a passionate social worker. What else you want to know.. Were you interested in music since your childhood ? Music came fully in my life a bit late. No doubt I was quite fond of music however I never performed or did anything of that sort during my childhood. Reason being that Music is not appreciated as a viable career option by parents and same is my case. My parents did not support my passion towards music at earlier stages. How did you finally pursue your passion i.e. Music ? And I met music when I was studying LLB 4th Semester. One day while I was sitting with my friend and we thought that we should do something different because frankly I was not interested in studies and opted for LLB by chance. So we thought of learning how to play Guitar. I brought a new Guitar within 10 days after this idea popped my mind. However my friend dropped this idea. But due to my bad luck I had to undergo a surgery for tumor which kept me and my guitar at bay atleast for 6 months. Then I got in contact with my guru, my teacher, my mentor Mr. Anmol Amla who taught me how to play guitar. I would like to take this opportunity to show my immense gratitude to him. However I was a quick learner and picked up quite well. Anmol sir gave me a chance to play in his band, which i still do. Not much time has passed that you learnt guitar and turned to music, then how did O Meri Jaan come about ? At that time I never thought to write a song. This paragraph remained as is for next five months after that I completed this song. Hmm… Friends supported me a bit. Yes family too appreciated me once I started getting prizes (that’s fine). And Anmol sir always stood by me. Now that your first song which you have written, composed music and even sung is a grand success, what are your future plans ? Future plans…mm…to compose some original music. I always carve for originality. But due to financial constraints I have not been able to exhibit my full talent. Music is my life and I would cherish public support for my future endeavors I expect people dealing in music to sponsor me and hire me (smiles).